Designer and artist Elaine Lustig Cohen was married to Alvin Lustig from 1948 to 1955. She managed her husband’s studio, serving as a secretary, production assistant, and draftsperson—the “office slave,” as she recalls. As Lustig lost his eyesight to diabetes, he increasingly relied on his wife to execute his concepts. Following Lustig’s death in 1955, Cohen established her own design practice. Her covers for Meridian Books and New Directions, designed from 1955 through 1961, use abstract structural elements, expressive typography, and conceptual photographs to richly interpret the books’ contents. 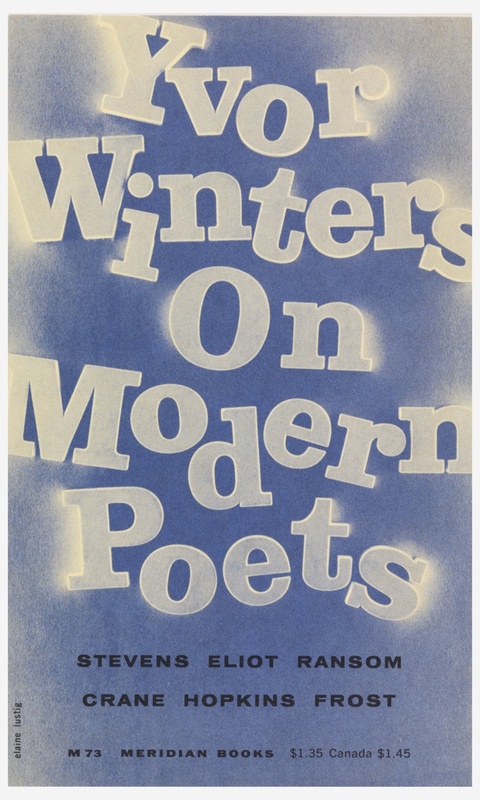 This book cover features a photograph of commercially manufactured letterforms shot against a blue background. The typography thus serves as illustration. Cooper Hewitt interviewed Elaine Lustig Cohen in her New York City studio in September, 2014. The museum presented a solo exhibition of her work in 1996. Ellen Lupton is Senior Curator of Contemporary Design at Cooper Hewitt, Smithsonian Design Museum and Director of the Graphic Design MFA program at Maryland Institute College of Art.